Education has become more high tech than ever before. Teachers are finding new ways to integrate technology into the classroom to keep kids interested. Gone are the days of open your text book to page 372. Now it’s more like open your browser to this website or direct your attention to the screen at the front of the class. After the Apple event yesterday debuting the iPad 2, we see many features in it that will take the education world by storm. Remote learning will be a possibility with the inclusion of FaceTime. Students can learn from home, conference with their teacher or sit in class when they are home sick. 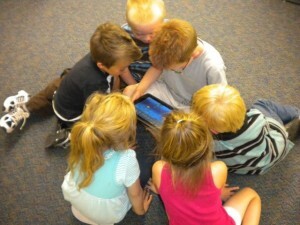 Schools could even partner with other iPad user schools to participate in group projects or conference about assignments. With the mirror imaging capabilities the iPad can stream it’s screen on to an HDTV. Lectures with a high volume of technology integrated will be the primary way teacher present material to the students. The mirror imaging will allow the teacher to have one hand on the iPad while the screen is fully visible to the students. Unlike the smart board which can become obstructed when students or teachers aproach to use the screen. And, with more and more educational apps, we are sure to see a rise in interactive textbooks. The iPad is a perfect medium for their use. Students will most likely be the ones who teach us what the iPad is capable of. The sky is the limit for where education will be taken with new devices such as these. I’m sure we will be seeing more and more of these types of learning developments in the future.